Great ads make you look, make you feel and stay with you for a long time. You never forget the classics. The beer scene is more complex today than it was in the early 1990s. Presumably back then, Dublin had Guinness, London had Pride and Manchester had Boddingtons. 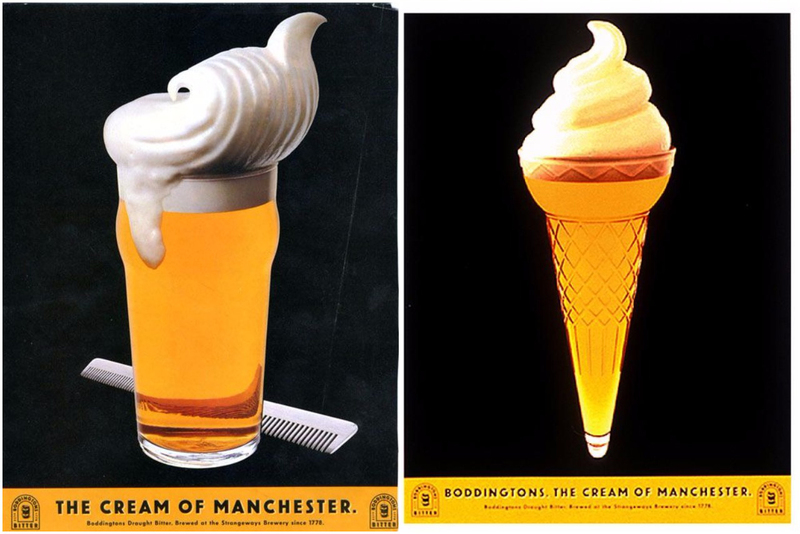 The brief must have been to shout about the creamy head – something that surely defines the quality of a beer here in Britain and gives Boddingtons a point of difference. The double meaning of "cream" meaning the "best" of Manchester is clear and delicious. The colourway alone screams out like a hazard sign, with big punches of yellow on black. While the tonality has that directness and friendliness of the north, the key move here was to transpose that cream on to other British icons – synonymous with creaminess. A choice as smart as it is playful – and one that cements the product to its location. Most importantly, I’m craving a big creamy pint of Boddingtons (even though it’s only 10am). Job done.